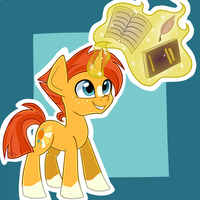 He's probably the only pony in Equestria who loves books even more than Twilight. I'm curious about whether he'll appear in season 7 or not. If Hasbro was making a new Mlp game, I'd definitely wish they would ask permission for your ideas. I'm not sure what they'd need my permission for. It's their property after all. They have no reason to ask me if they are allowed to make MLP games. Well I just said that because they looked liked video game sprites to me and they were very good. If you know what I mean. Can you get him walking on your screen? if so how? Hey is it possible you could make one of my oc running also? Oh ok but what program did you use to make this? Mostly Paint Shop Pro 5. You can also read my FAQ for more information.